Attention ALL Students!!! Remember, all artwork is due by this Friday, May 19th. Attention all 8th grade students!!! 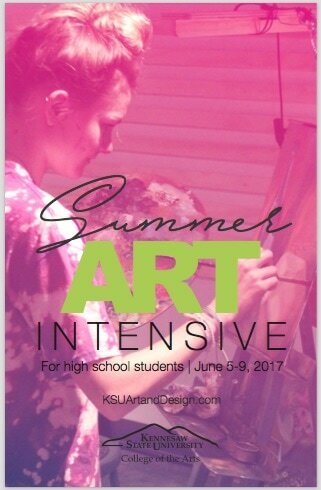 We are very excited about this year's Summer Art Intensive. 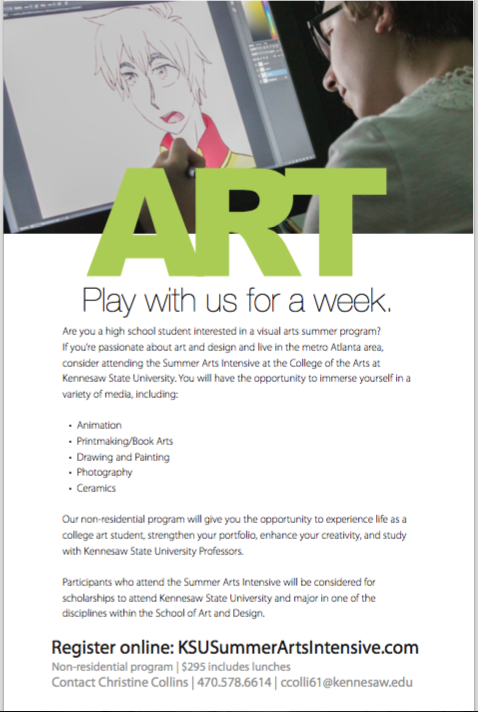 Please click on the following link to see more http://arts.kennesaw.edu/summer-arts-intensives.php or open the attached Intensive postcard. Please share with your students. This Intensive is an incredible experience and only $295/week that includes meals. It's going to be fantastic!!! 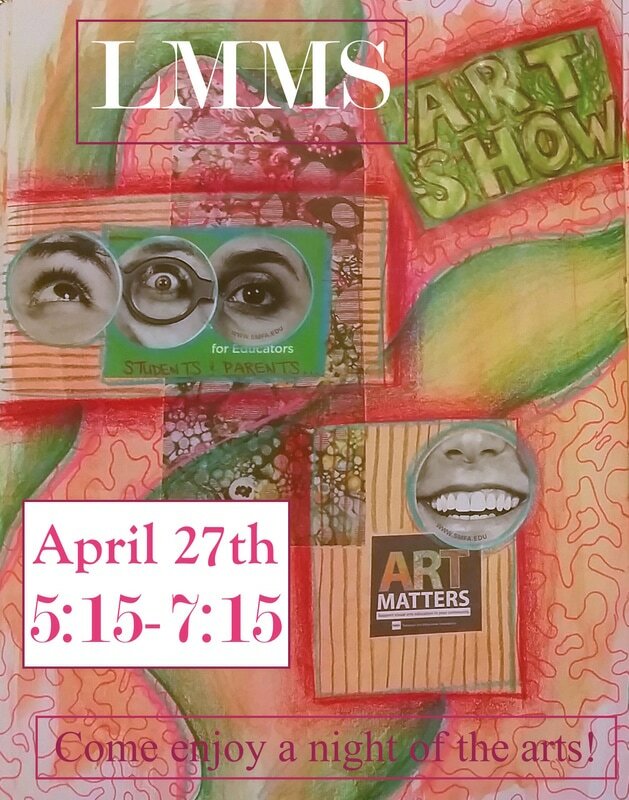 The Annual LMMS Spring Art Show is Next Week!! All students who have had art THIS SEMESTER have at least one work in the show!! Be sure to stop by and check it out!! Students should be bringing in a sketchbook and a large eraser to class by Friday. Please refer to your student's individual syllabus for instructions on materials needed for the class. Another Cool Gelli Plate Technique! I'm obsessed with Gelli Plate mono printing, so I thought I'd share! Welcome back for another great semester of Lost Mountain Art. Above, you can click on your student's art class to get information specific to that course. On each course page, I will be placing rubrics, handouts, examples of projects, and letting you know of upcoming events related to your student's art course. I thought this was such a great technique, so I thought I would share! Middle School Masters Reception is Thursday!! If you had a piece chosen for the Middle School Master's art show, don't forget that the reception is THIS THURSDAY! 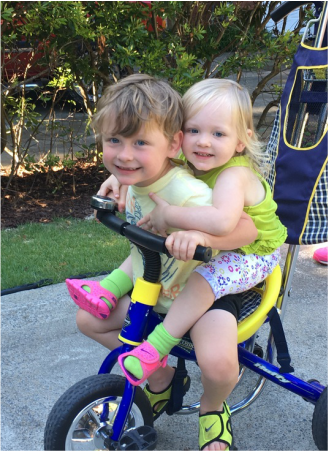 We hope to see you at the Big Shanty Art Station, any time between 6 and 8! Congratulations to the following students who will have work featured at the Middle School Master's Art show. This work is the presents the best of Lost Mountain art along with other middle schools and will be featured at the Kennesaw-Big Shanty Art Station for the month of March.